After three days of eating bread and cheese (our go to lazy eating solution when we are at the boat) we got back to work and made this for lunch. Another Yotam Ottolenghi recipe from the book Plenty. This very simple salad is both very quick to make and incredibly tasty. I think it looks pretty awesome too. I can’t imagine many people will find Ewe’s Mozzarella in their local supermarket. Ottolenghi himself goes to a cheese specialist not far from his restaurant in London. I used a good quality Buffalo Mozzarella as I didn’t have the time. Ottolenghi does this a lot. A green thing, a nut thing, a fruit thing and a cheese thing – with a dressing. And I have to say it seems to work everytime (except with Verjus !). 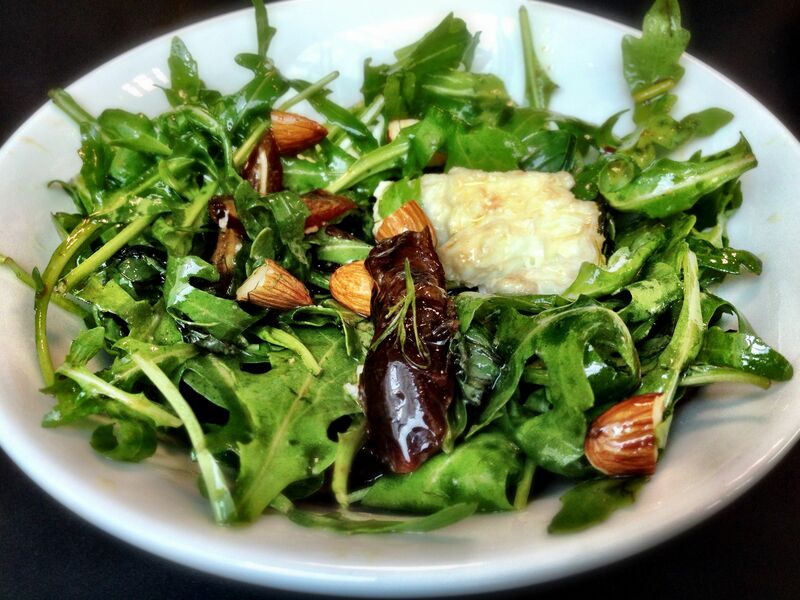 This one is rocket, mozzarella, almonds and Medjool dates. The dressing is olive oil and pomegranate molasses. There’s some basil and dill in there too. I love this – very fresh – very summery – looks beautiful – and got me back in the mood for cooking again. It’s #VeggieWeek this week. Check out the lovely food being posted on Twitter. I’ve made this recipe before – from Yotam Ottolenghi’s Plenty – but it was way too spicy and way too salty for Freya – so I ended up eating the lot. I shortlisted it again for this round of recipes – but toned down some of the ingredients so that it was a ‘sharing plate’ rather than something all for me. I think it looks really classy. When you look at the ingredients for this recipe you’ll realise what I mean. 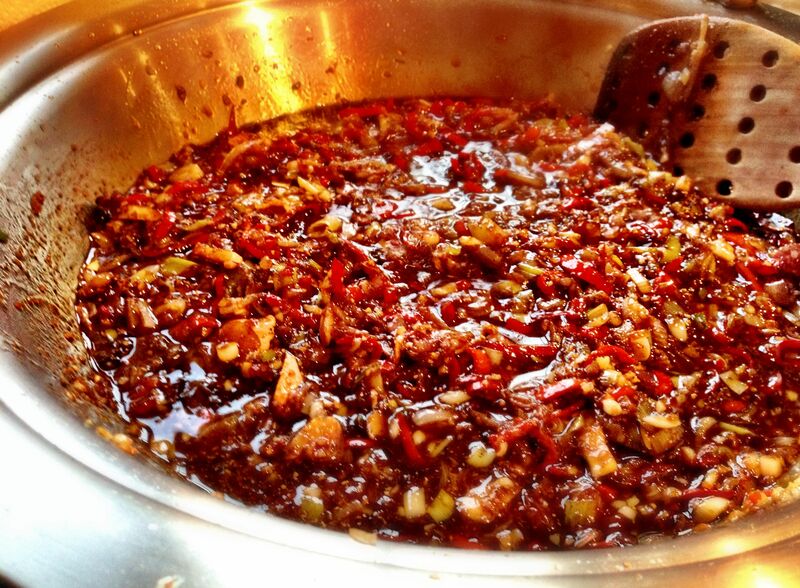 There are 8 red chillis, 12 garlic cloves, 5 tablespoons of black pepper, 3 tablespoons of ginger, and 12 shallots. Hopefully Ottolenghi won’t tell me off for giving out the quantities here – but it does make you think ‘gee that’s gonna be hot’! 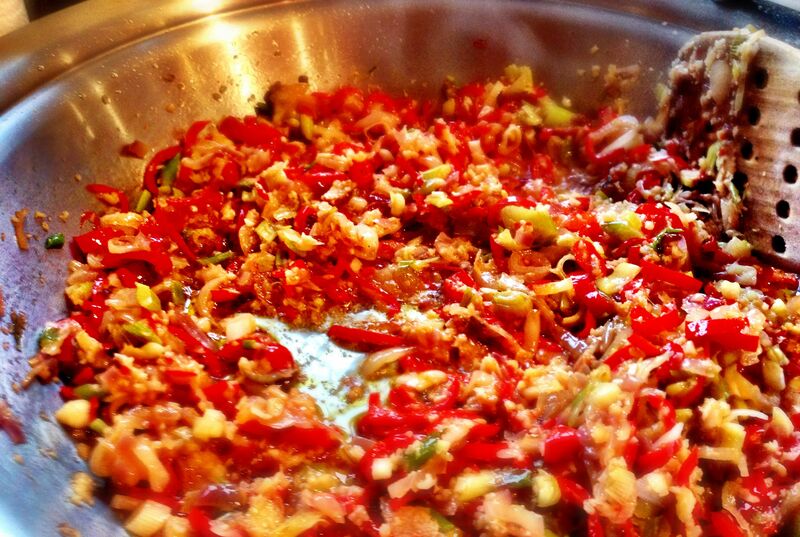 I used 4 chillis, 6 garlic cloves, 3 tablespoons of pepper, half the ginger – and kept all the shallots. It was still too hot for Freya! I probably would have used more pepper but my pepper mill decided it had given me enough ground pepper already and refused to give me more than 3 tablespoons. And that took me nearly 20 minutes. Next time I’ll be smarter and use my pestle and mortar. which is essentially three types of soy sauce. 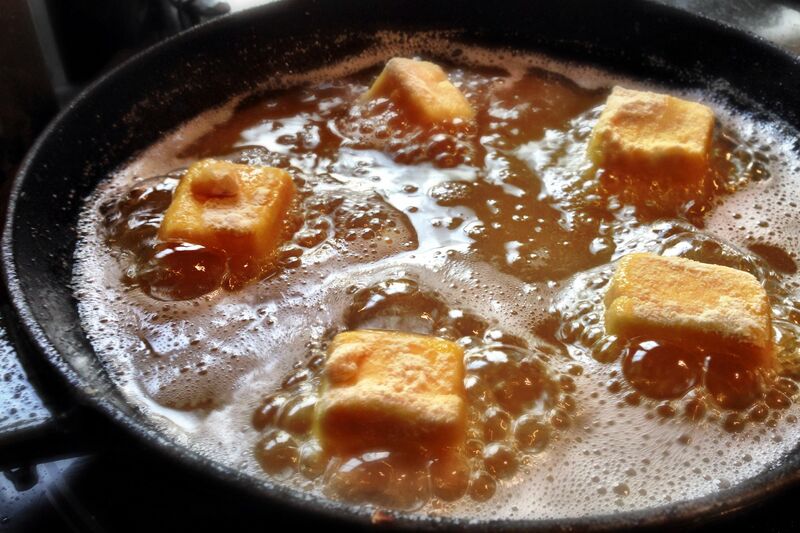 Once that’s all done you return the tofu to the pan, reheat and serve. I love this dish – it’s so tasty and the tofu is really crunchy, having been dusted in cornflower and fried at quite a high temperature. I love hot food. I love chillis, and I love those bottles of ‘dare to try me’ sauce. I have lots of them! As I’ve said before though with recipes that call for chillis; it would be nice if they said how hot the chillis should be – or how big – because there is such a wide variety of size and heat. You could end up making very different dishes every time. I don’t think Freya will ever like this one as it is just a little bit too spicy. 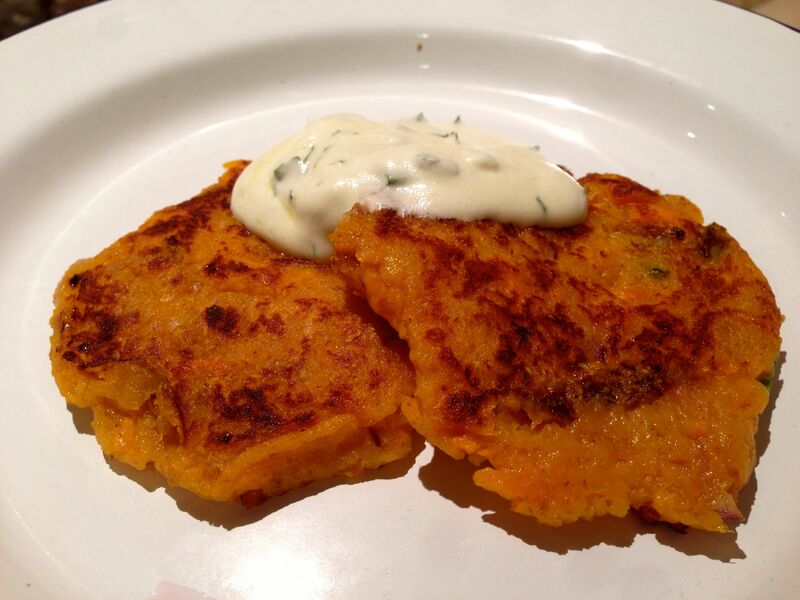 Fortunately we’d already had some quite nice Sweet Potato pancakes so she didn’t go hungry. There was quite a lot left over (I’m not an animal!) so that was my dinner the following day too ! There was a lot of washing up after this. All the prep bowls, the cast iron frying pan for the tofu, my lovely Al Clad Tagine for the sauce – and all the utensils. Not a quick dish – but a very tasty one. I shouldn’t have made this. I made a mistake and picked the wrong recipe out of Plenty by Yotam Ottolenghi. I did however have all the ingredients so it doesn’t matter – and I’m glad I did. You wouldn’t think of having, rice, rice and quinoa would you – but that’s what this recipe is – Wild Rice – I used the giant variety that Ocado sell, brown basmati and the red Quinoa. The recipe calls for mixed basmati and wild rice (which you can apparently buy ready mixed) but I’ve never seen it so I mixed it up myself. I think this is probably my favourite so far from Plenty. 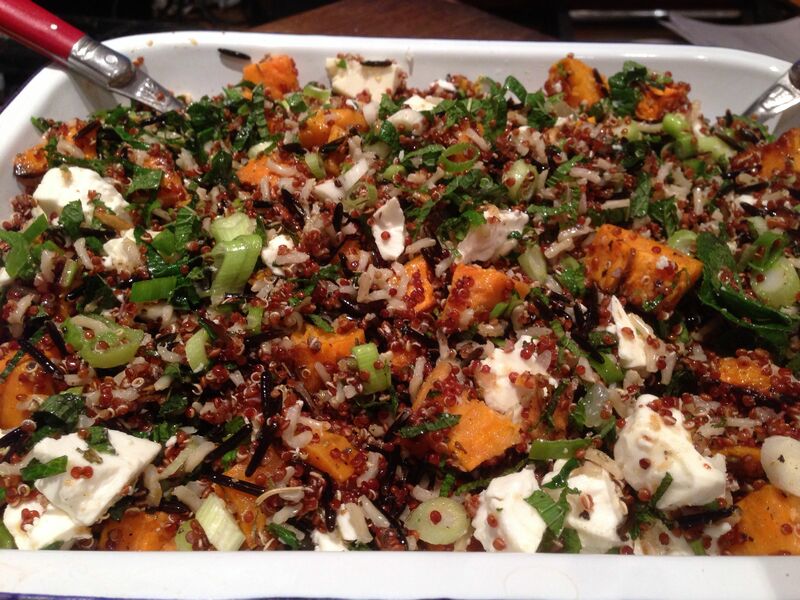 I really love Quinoa and I love roasted Sweet Potatoes. 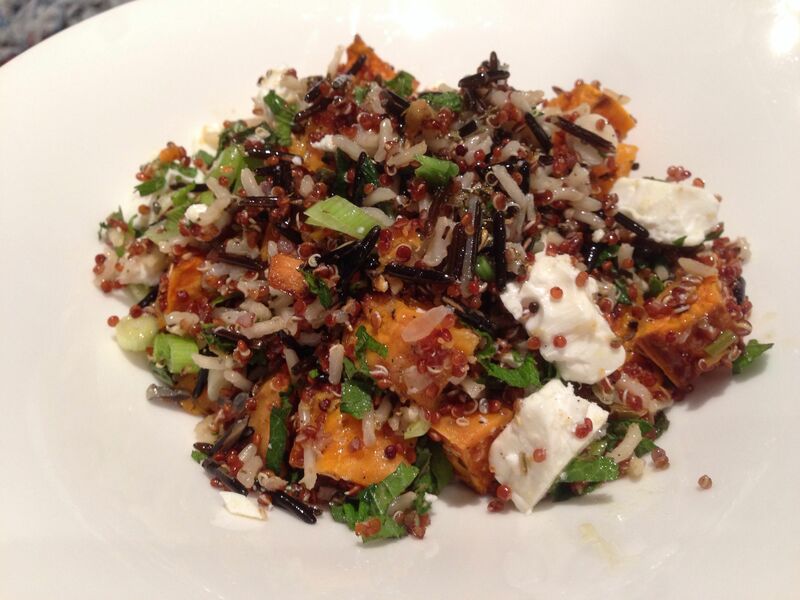 I’ve made a couple of recipes like this one – adding Wild Rice really adds an extra texture. As you can see – much clearer in the panview – there are spring onions, goats cheese and lots of herbs in the recipe too. You can’t see the Iranian lime. Here’s why! Iranian limes come dried and are rock hard – not ‘I’ve left a lime in the fridge’ rock hard – but ‘nutmeg’ rock hard. It is suggested you mill them in something like a nutmeg mill. I seemed to get away with using one of those fancy microplanes – it took me quite a long time to get two tablespoons worth – and my hands ached afterwards – but I got there in the end. Iranian limes smell amazing – like limes obviously – but so intense. And it adds an incredible sharpness to the dish. If you are making a stew you can just make holes in the whole lime and add it in – and it will infuse – but I haven’t tried that yet. I’ve never seen these in a shop – and according to the recipe you can buy it in powder form – but it is not as intense a flavour. Mine came as part of my Ottolenghi gift box that Freya’s mum bought me for Christmas – finally got to use them ! I like this kind of dish. You make a tray full of the stuff – you can double it up if you want – or pick at it while you work your way through ‘The Killing Season 2’ like we were. Absolutely lovely – I’m glad I accidentally made it. I sometimes wonder about my choices. Freekeh (high in fibre), Garlic soup and now Brussels Sprouts! I guess I’m not doing myself any favours! That said – Freya thinks this is the best thing I’ve made from Yotam Ottolenghi’s Plenty. Tofu is a tricky ingredient. 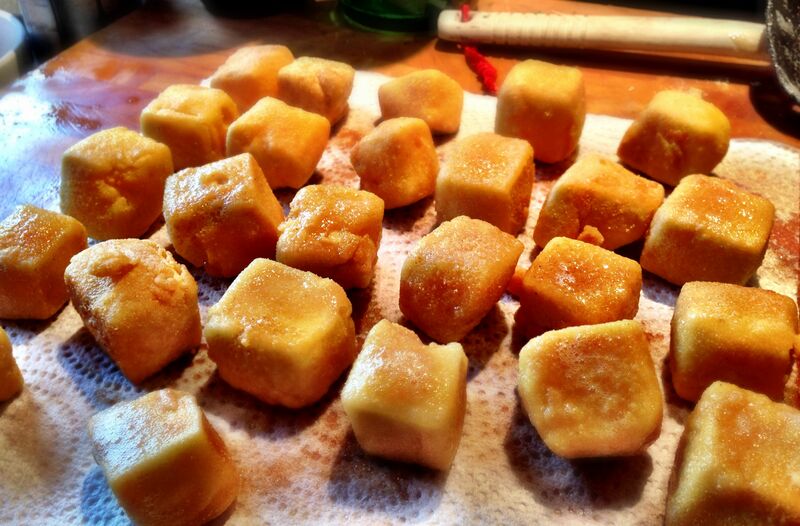 Whenever you see a tofu recipe you really should consider leaving it in the marinade you make for 24 hours. Leaving it for 30 minutes while you do the rest of the preparation for a dish just isn’t long enough for the tofu to take on the marinade’s flavours. Tofu is ingredibly bland if you don’t do something to it, so that’s my recommendation. 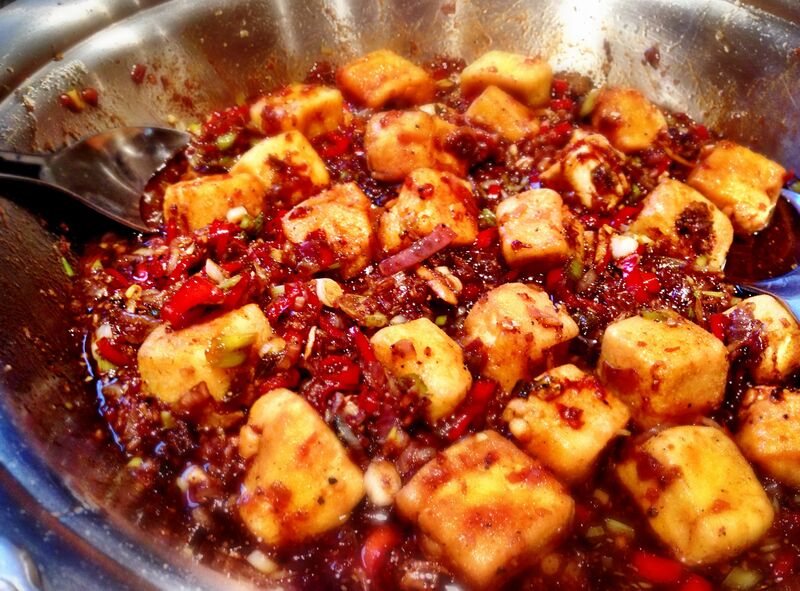 The marinade for this tofu was sweet chilli sauce, soy, sesame oil, maple syrup and rice vinegar. Leaving the tofu for a while really made a difference. 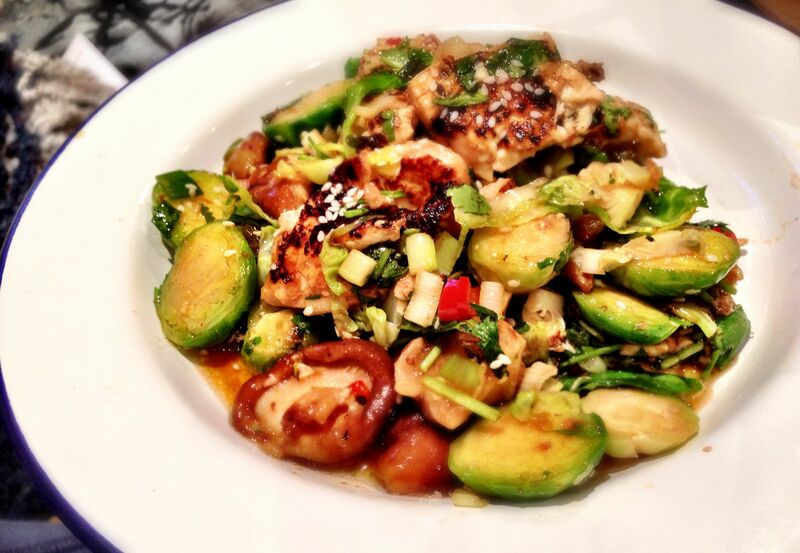 Apart from the tofu preparation this is a very easy recipe; just pan fry some brussels, spring onions and red chilli, add shitake mushrooms and right at the end, carefully char the tofu and add to the brussels. 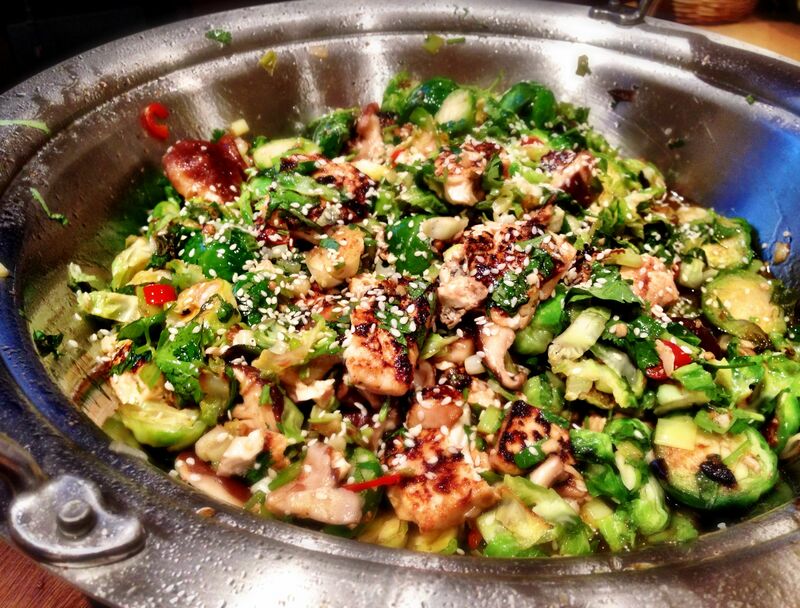 You dress the dish with coriander and sesame seeds. This is so tasty. And because you only pan fry the brussels for maybe a minute or two on a high heat, they stay very crunchy but look lovely and glossy – coated in the oil. There was a time when brussels were for Christmas and nothing else. Now they are good any time of the year – and in a recipe like this they are perfect. I think you could probably substitute brussels for kale as long as you cooked it the same. Something I might try later in the week! There was plenty of this for us to take for lunch the next day – but we got greedy. So we ate it all and ended up having to go out for lunch the next day. Very confusing for the people at work that just expect to see exciting food each day! Definitely a keeper this one – just remember to marinade the tofu for longer than it says! This incredibly simple salad is lovely. 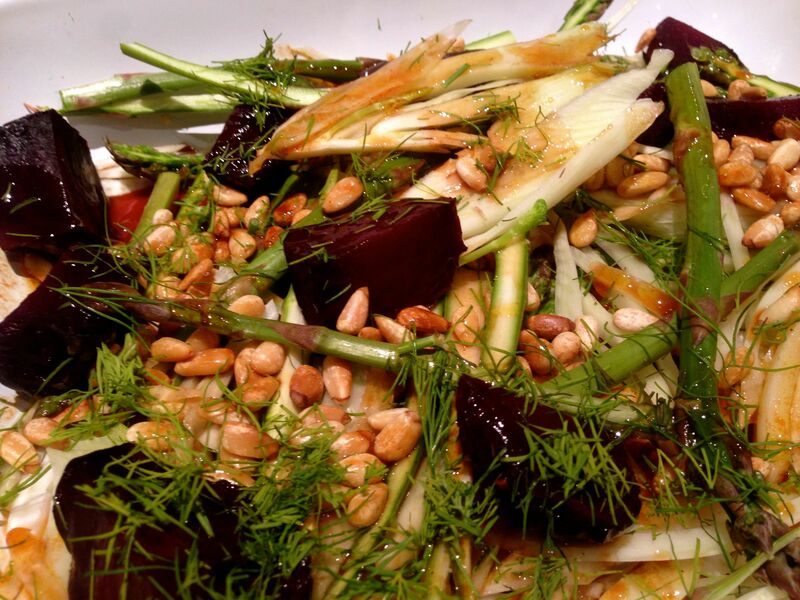 Yotam Ottolenghi makes amazing salads – this is another one from Plenty. Simply prepare some pearl barley (boil it until it is tender and has a little bite to it) and then drain and cool under the tap. 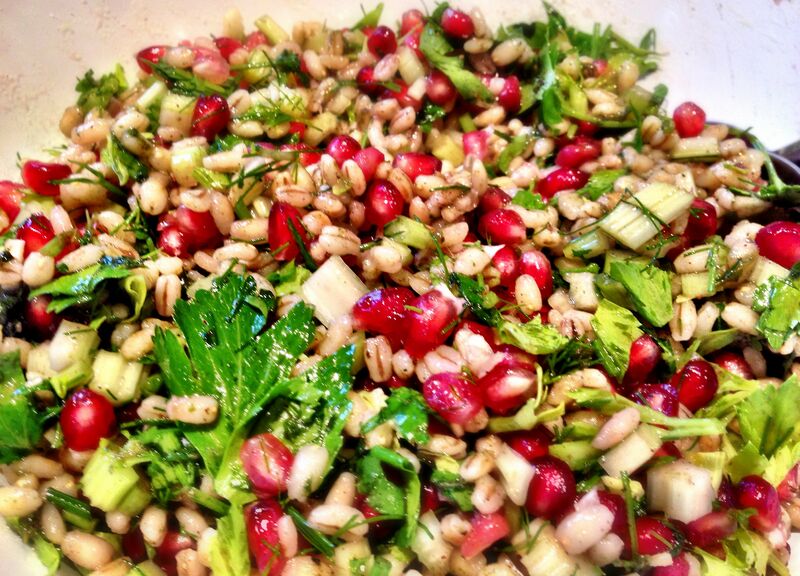 When it is done throw in some pomegranate seeds, diced celery, coriander, dill and a dressing. Couldn’t be easier than that. If you buy untrimmed celery, keep the celery tops (the leaves) and add them at the end too. You could probably make this in less than 30 minutes. I knocked this up in next to no time and it really tastes so fresh, crunchy and filling. I only made this to keep us going while I made something else – but turns out I needn’t have bothered. I was surprised at how full I was after only one bowl. Plenty of leftovers meant we had it for lunch at work the next day too. As a child I thought pearl barley was something cheap you used to pad out a stew. How things have changed. It crops up in many of Ottolenghi’s dishes – and other Middle Eastern themed cookbooks. It’s another great substitute for rice (much like freekeh) and has five times as much protein.